12 tracks: The Magical West * Jamie Raeburn * Ythanside * The Trees They Do Grow High * Will Ye Gang Love? * Smile In Your Sleep * My Donald * Personent Hodie * Kishmul’s Galley * Ca’ The Yowes * King Orfeo * Bridge Over Troubled Water. Barbara Dickson OBE is a multi-million selling recording artist with an equally impressive Olivier Award winning acting career. She has firmly established herself as one of the most enduring and popular entertainers in Britain today. With numerous awards for acting and singing, hit singles, gold and platinum albums Barbara is no stranger to success. In the 1990’s Barbara began to move away from the pop scene and back towards acoustic and folk music. This resulted in the 1992 album ‘Don’t Think Twice, It’s All Right’, a selection of Bob Dylan songs, and 1994’s ‘Parcel of Rogues’, featuring folk music from the British Isles. 1995 saw the release of ‘Dark End of The Street’, which combined traditional music with songs by favourite songwriters. 2008 was to prove a busy year for Barbara. Her next CD, ‘Time and Tide’, was released featuring the new direction which has become a feature of her music, blending together old and new songs with a distinctive atmosphere prevailing throughout. The varied song choice included ‘Palm Sunday’, which marked her first writing collaboration with Troy Donockley who again produced. 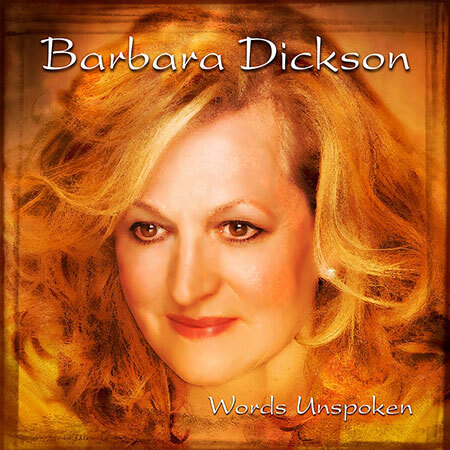 ‘Words Unspoken’ includes another Barbara and Troy song-writing collaboration, ‘The Magical West’ which opens the album and should catch the attention of reviewers, presenters and fans alike. The album ends with the Paul Simon classic ‘Bridge Over Trouble Water’, sung beautifully to a gentle guitar backing. In between, Barbara interprets the eight traditional songs with sensitivity and confidence: ‘Jamie Raeburn’, ‘Ythanside’, ‘The Trees They Do Grow High’, ‘Will Ye Gang Love’, ‘Presonent Hodie’, ‘Kishmul’s Galley’, ‘Ca’ The Yowes’ and ‘King Orfeo’. ‘Smile in Your Sleep’ written by Jim McLean and ‘My Donald’, by the late Owen Hand, completes a formidable album with artist and producer in total harmony. Barbara is in fine voice throughout and the arrangements are both excellent and varied. The multi-talented Troy Donockley plays electric and acoustic guitars, Uilleann pipes, whistles, bouzouki, keyboards and adds percussion and backing vocals; Brad Lang plays double bass, electric bass and also adds backing vocals; Frank Van Essen plays violins, viola and drums; Andy Dinan plays fiddle; Lucy Muir plays harp and Nick Holland adds vocals.